Okay, I guess this comic would be confusing for non-programmer type people. Tech interviews are terrifying, by the way. I just am so afraid of blanking out. He he I like it. Silly daily editor. That must be such a strange question to someone who has never programmed, haha. It must be strange for non-programmers to listen to programmers. When we talk about strings, I wonder what they think. 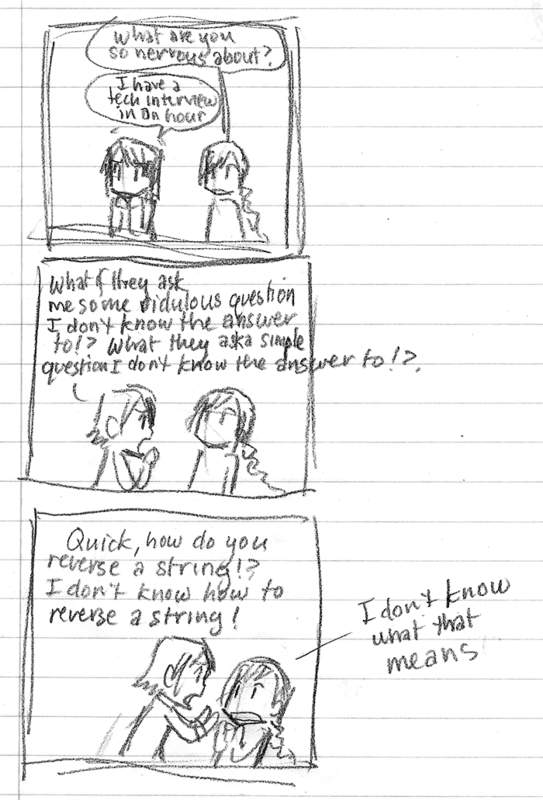 Is it yarn or string theory? haha. I don’t know how to reverse a string, but at least I get it. Heh, us programmers give ourselves a lot of pain, overthinking it and then using geekspeak. The other person goes into MEGO and we don’t understand why. What you have to learn how to do is known as an “Executive Summary” i.e. Kindergarten for adults.